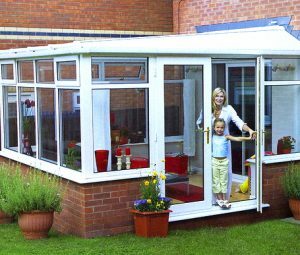 Conservatory French doors are generally a matching pair of outward (centre) opening, side hinged doors, but they can occasionally be fitted as inward opening if preferred. For wider openings they can be fitted alongside each other so that you can have more than one set of openers, or you can have side panels attached to the frames. For security, they can have locks that are anti-pick / anti-drill, that also resist bumping & snapping. They are available in a range of colours & finishes, including smooth or Wood-grain effect. This type of design is very useful where space is limited, French Doors usually open outwards and therefore you don’t have to worry about them interfering with interior furnishings. They are also very easy to use and because both the doors can be opened at the same time they give plenty of clear opening space and loads of fresh ventilation. Usual seen with multiple small glazed panels, which gives them their easily identifiable look, they can be fitted with plain glazed panels if preferred – the glass is almost always double glazed & toughened safety glazing, but its recommended that you confirm the glazing is safe for use at ground level as a floor level glazed door is vulnerable to damage and may injure someone if the glass is not meeting the current British Standards – it is also required by building regulations.